I worked yesterday afternoon on getting some card samples done for a proposed May class and hit a wall. That is, my mojo stopped. So, I started blurfing (blog surfing) the many great blogs I follow and seen a great sketch by Tuesday Morning Sketches that worked perfectly with the papers I chose to showcase in my class. This card is my rendition of their sketch #244. This card also works for today's Red Rubber Inspirational #115 masculine challenge! This is the first time I've been able to use 1 card for 2 challenges! I'm using new papers from Graphic 45 called Good Ol' Sports. This is a great line and I think I'll do good with this class. 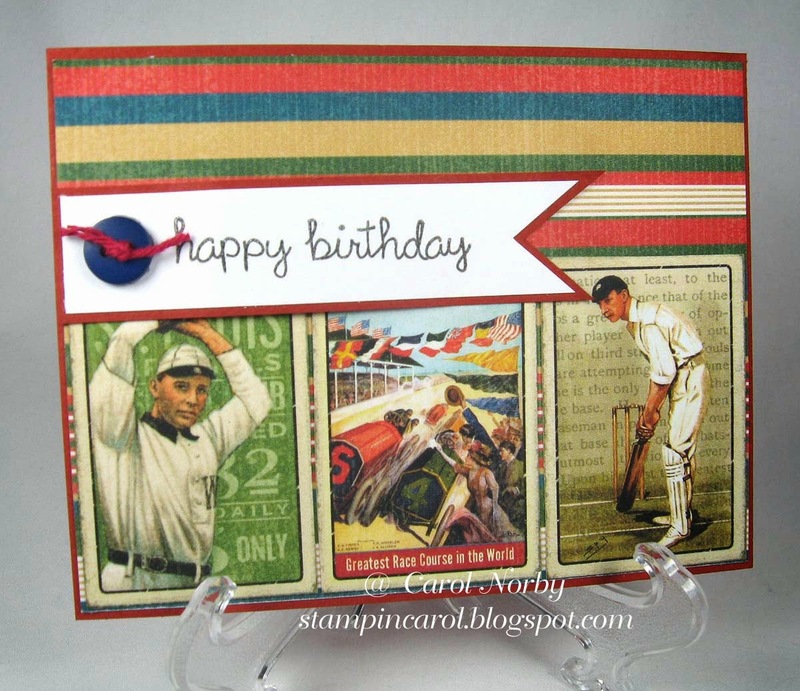 The stamped image is from a stamp set called Happy Everything by Lawn Fawn. I didn't use a RRD stamp set as, since this card is for a class at AZ Scrapbooking, I had to use stamps the store carries. The twine is from The Twinery. It's a solid twine and I purchased the solid sampler last year when it first came out. Great stuff! They now have some cool shimmer twine but I have the stripes and solid sampler sets and I don't need any more right now. This is another card using a button and twine. I made the blue layer under the football player wide enough to use my 1" circle punch to create the spot for the button. I really like the looks of that. What do you think? I still have 2 more cards (1 now done) to post with this great set. I have to have them completed with my supply list and directions ready by Monday for the instructors meeting at AZ Scrapbooking where I teach. I want to thank all those that popped by yesterday. I had a record setting day of hits! Great cards for the guys. I am really taken with this paper line as well. These are such perfect guy cards! Love them both. Thanks for coming to play with us at Tuesday Morning Sketches this week! I love the colors and the images you used - great guy cards! Thanks for playing along with us at Red Rubber Inspirationals! Awesome masculine cards!! LOVE the papers and colors! Thanks for joining us @ Red Rubber Inspirationals!